Seattle, WA, July 26th, 2018 – AudioControl (audiocontrol.com) makers of innovative high-performance audio solutions for the residential, commercial and automotive markets has introduced the CP1 series of powder-coated steel cover plates for their ACM Micro family of compact high-performance car audio amplifiers. The CP1 cover plates physically connect two ACM amplifiers together, enabling installers to create a seamless and attractive single-chassis appearance from a modular multi-amp system. AudioControl’s patent pending modular, configurable system concept enables installers to bring together a number of amplifiers in various configurations, allowing a greater number of audio channels to be created and neatly housed beneath a CP1 cover plate. The CP1 cover plates are available in three models; the CP1-2.600 (combines two 1.300), the CP1-3.600 (combines the 1.300 and 2.300) and the CP1-5.600 (combines the 1.300 and 4.300). Now installers can sell multiple ACM amplifiers featuring the channel configuration that best suits each customer and offer an elegant, seamless cosmetic finish. “Now that all of our ACM models are shipping, these sleek cover plates really give our dealers the ability to adapt a highly flexible modular approach to system design, combining different models seamlessly to best suit each customer,” explained Chris Bennett, National Sales Manager – Mobile at AudioControl. “It is our goal to offer the right mix of products for 12-volt dealers, and the ACM amps with the CP1 cover plates give them a range of high-performance amplifiers at a price point and form factor for every customer. The AudioControl ACM amplifiers are loaded with features and deliver superb sound quality for any system design, yet amazingly are only 1 ½ -inches in height and compact overall footprint measuring 8-inches by 3-inches. ACM Series amps can be mounted with controls oriented up or down, and reversible cover plates allow flexible mounting options when paired with AudioControl DM series DSP processors or when using multiple ACM Series amplifiers in confined spaces. All ACM models have been engineered to deliver critical features such as separate speaker and preamp level inputs, giving installers the option to use any aftermarket head unit or their customer’s factory installed system without the need for additional adapters. Each ACM amplifier is 2-Ohm stable and features a 12dB/octave Linkwitz-Riley Crossover and AudioControl’s GTO signal sensing circuitry for the utmost in system flexibility and ease of installation. The ACM-1.300 also includes AudioControl’s patented AccuBASS®circuitry. Based on this outstanding feature array and superior performance, the AudioControl ACM Micro lineup delivers audio entertainment euphoria even in the most confined automotive setting. ACM amplifiers range in MSRP price from $279.99 (ACM-1.300), $349.99 (ACM-2.300) and $349.99 (ACM-4.300). If you're looking for a good pair of headphones, it's easy to turn to generations of experience. AKG has been making high quality headphones for almost 70 years. When they want to bring out the top of the line headphone, they know how to do it right. And that’s just what they have done with the AKG N5005. It is a premium top of the line IEM that satisfies the most demanding consumer. The AKG N5005 came in a great looking color printed box, with photos and specs of the product. Opening the box revealed quite the presentation! There were two levels to discover. The first provided the IEM ‘s, sound filters, hard zipper case, and serial number badge. The second level showed the additional ear tips, charging cable, and three different cables. All were held in place with custom cut foam. The actual IEM’s were made of a highly polished metal with a black finish on the first half, and a plastic finish on the back. Materials used in the construction was metal and plastic. Quality of materials used, as well as the fit and finish, was excellent! The owner’s manual was also included, as well as a cleaning tool and airline adapter. When I opened the box, I was blown away by the presentation. Everything had its spot in the custom cut foam. With the filters, you can tailor the sound to your liking, with options for reference, bass boost, mids boost, or high boost. And there is a black polished metal holder for all of the filters that was clearly labeled. The hard zipper case had pockets on both sides to hold all of the accessories. There are six sets of ear tips to give you the best fit. And just so they didn’t leave anything out, there are three sets of cables. You read right…three sets! One is a 2.5 mm cable, one is a 3.5mm cable, and the last is a Bluetooth cable. So you have all of your options covered for any source player, and for either wired or wireless listening. And of course there is also a charging cable. The design of the AKG N5005 is also spectacular! For low bass, a balanced armature is harder to get the performance as you would from a dynamic driver. So I have seen many companies use a hybrid design, incorporating a dynamic driver for the lows, and a balanced armature for the mids and highs. But as with everything else in the design, AKG has taken it to a whole new level! AKG has come up with a 5-way hybrid design which utilizes quad balanced armatures, and a dynamic driver. So there are 2 balanced armatures for the highs, 2 balanced armatures for the mids, and the dynamic driver for the lows. So there are high quality components to provide the best sound, and there’s also the multiple sound filters so you can also customize the sound to your liking. If this aural bliss which the AKG N5005 is poised to deliver is not good enough, AKG also has the looks covered as well. With their exterior black polished metal finish, they will also look like jewelry. Now let’s hear how they sound! Eric Bibb: Why are People Like That-vocals were silky smooth with very good texture and timbre. Piano was very natural, more so than expected. Bass had very good low end extension and played with a ton of authority. Percussion was really crisp and clean with very good resolution and impact. Harmonica was really dynamic. Gershwin: Rhapsody in Blue- clarinet was incredibly smooth with excellent resolution to hear the woodiness of the reed and tonguing technique. Piano was very natural sounding and extremely well articulated. Brass was extremely dynamic, without appearing brassy. Bassoon had great extension in the midbass and excellent texture. Flute had extremely good air. Imaging was very good, soundstage was big with good depth. Earth, Wind and Fire: Let’s Groove- vocals were silky smooth like honey, with excellent timbre and pitch definition. Bass was extremely full, deep, clean and hit like a sledge hammer. Percussion was extremely crisp and clean and very dynamic. The claps were also really crisp and dynamic. There were tons of instruments, and they all came through loud and clear. Imaging was spot on, with a big sound stage. Katy Perry: Dark Horse-vocals were smooth like honey, with excellent resolution of the timbre and texture. Bass was very full, very deep, hit hard and did so with a ton of authority. Claps were also crisp and very dynamic. When it comes to In Ear Monitor's, AKG didn't just hit it out of the park. It went past the parking lot as well! The AKG N5005 provides killer aural candy for your ears, with its 5-way hybrid design, and hardware sound tuning with its custom sound filters for any preference. Add to that the multiple cables to enable use with virtually any source player, including a wireless cable for Bluetooth! And if that wasn't enough, they have the polished metal finish for a jewelry look. Excellent build quality, sound, looks, and plethora of accessories, the AKG N5005 is the whole package. At $999 MSRP, it's a bargain for what you are getting. No matter your sound preference, AKG has you covered. 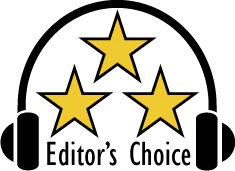 based on their design, features, quality, and performance, the AKG N5005 have easily earned our Editor's Choice Award. For more info and complete specs, check out their website at www.akg.com.